• A minimum cycle time of 6 seconds from collection of containers, to placement upon an outfeed conveyor (Mould and Container Design dependent). • Inversion of containers to help remove foreign bodies/particles. • Inclusion of HEPA filtration, for more demanding mould applications. • Programming of multiple products, in a matter of seconds, via an intuitive touch screen display. • Integration of container testing, prior to conveyor placement. • Control signals provided as standard for a Box Packing system. To compliment the MK5 Robot, PCE have developed their innovative PCE AirFlow Leak Test; which uses the latest testing methods to detect leaks as low as 1cc/min, as opposed to the more conventional method of pressure decay testing. Following the PCE AirFlow Leak Test, failed containers can be expelled into a reject chute, providing the added assurance that no failed products can reach the outfeed conveyor and enter the supply chain. Manual Test Valves are also provided, so that the integrity of the test and reject operations can be verified, whilst the system is running. The MK5 Robot has been designed to enable the incorporation of further functionality, including blocked bore checks and camera inspections for deformities or contamination. • Robust, compact design with a considerate footprint. 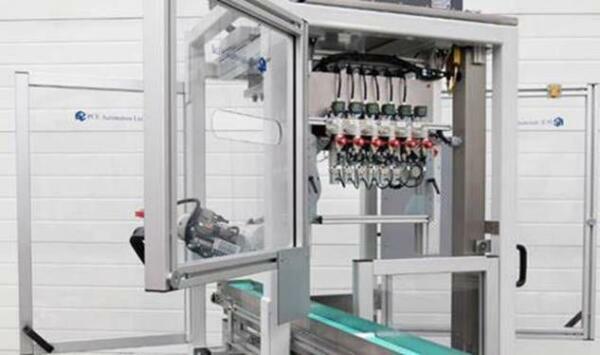 • Efficient application of pneumatics, reducing overall running costs. • PLC control with colour TFT HMI. • Flexibility to process containers of all shapes and sizes (Bottles /Tottles etc). • Simple integration with existing ISBM machinery. • Portable, simple to maintain. James Cook, Managing Director at PCE commented: “The MK5 Robot is a positive evolution of a long-standing range, combining flexibility with the strength of existing design. The incorporation of the latest testing techniques means that only compliant bottles can leave the machine, which delivers the added quality assurance that our customers expect. The 6-axis robot simplifies the set-up process for a variety of containers; requiring minimal changes and delivering high OEE figures”.